When I decided to write this book, I resolved not to fill it with grisly cases of criminals shot by citizens in self-defense. Those who believe that the private citizen should not be permitted to possess defensive firearms rely heavily on anecdotes of murder for shock effect; Carl Bakal's "No Right to Bear arms" is a case in point. Actually, almost every incedent Bakal and the others depict can be argued either way. Their opinion is that each atrocity could have been averted if the assailants could have been prevented from having guns; my contention is that almost every one could have been prevented or mitigated had the intended victims been armed and able to fight back against their murderers. An exception is the accicdental shooting, a statistically unlikely occurence that can, in my opinion, be eliminated by proper training. 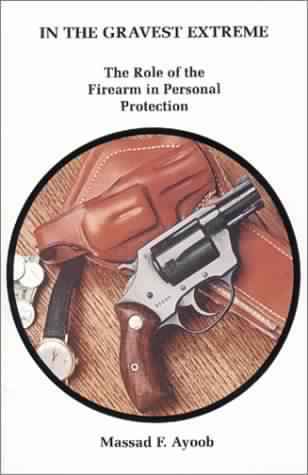 This book makes no attempt to convince the private citizen to acquire or carry firearms. It speaks to those who have already made the decision to do so, and endeavors only to advise them in the legal, ethical, and practical use of the deadly weapons they already own. The above was taken from part of the introduction from the book. 131 pages Gluded Softcover.